Wolf Connection received information that an “enormous mystery dog” was held at a shelter in Sacramento, CA, and that they were searching for the owner. Despite the press and outreach, no one stepped forward as the owner of this gentle giant. Pictures of this guy lit up excited debates about what kind of dog he could possibly be with the final consensus being that this 120 pounder must have jumped right out of Game of Thrones. After seeing the pictures, Wolf Connection knew right off the bat that the “mystery dog” was not the average dog! 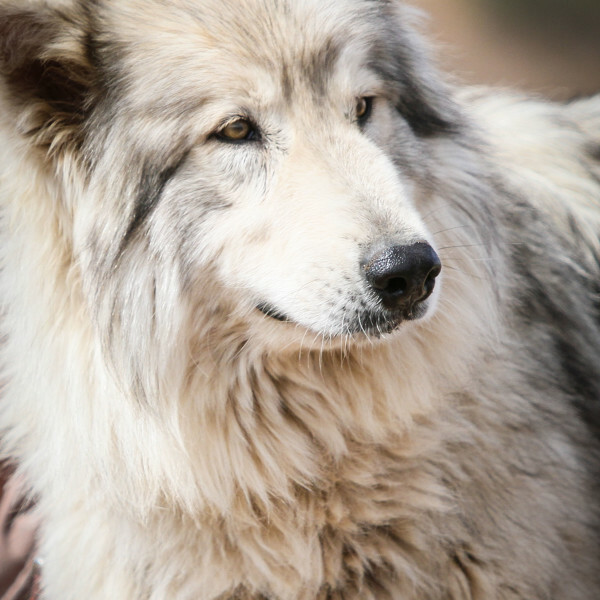 After researching our website and talking with us about our purpose and programs, the shelter’s manager decided that Wolf Connection was the best place for Ranger to have a well-balanced life. After a good bath and cleaning out the mats in his long fur, he made it home to Wolf Connection. Ranger loves everyone and he seems to understand how regal he looks with his luscious locks of fur that makes him stand out from the rest. He has become a highly regarded program animal.